We love homemade paint – it’s just awesome! Not only is it fun to use and experiment with, it’s also really easy to make, and most variations only take a few simple ingredients. I’ve written a post about our most recent homemade paint recipe on Playdough to Plato: DIY Erupting Flour Paint! It’s one of those DIY paint recipes that only require three simple ingredients that I bet you have in your kitchen right now. It took me 2 minutes to make the paint, and it kept E and N painting, giggling, pouring vinegar, and exploring for over 30 minutes! 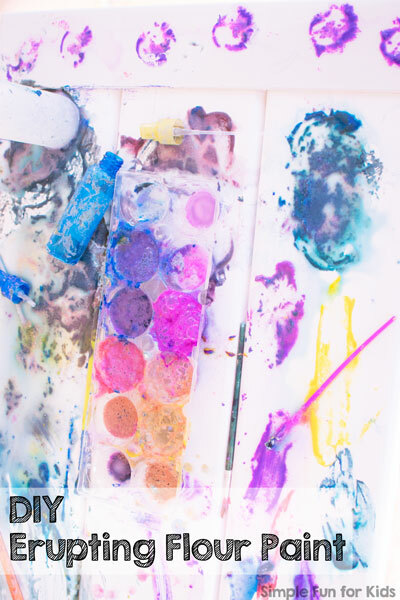 Head over to Playdough to Plato to find out how to make your own erupting flour paint! Or if you just want to make regular flour paint, there’s a recipe in Toddler Art with Flour Paint. Are you looking for other paint recipes?